My paper plate was not designed to hold syrup, but I covered it with fluffy golden layers drenched in melted butter and soaked in a sweet amber river of maple deliciousness. Whoever decided overeating should be the prelude to penitence was a genius. Why didn’t the churches of my youth know about this? Those churches excelled at food-centered faith, but somehow missed out on the spiritual implications of pancakes. Who wouldn’t want to belong to a church that confesses sins by eating copious quantities of sugar? How much different would my faith be if I had grown up with a full-blown pancake racing tradition? How much fuller would my experience of repentance be if I had learned to run while flipping hotcakes? 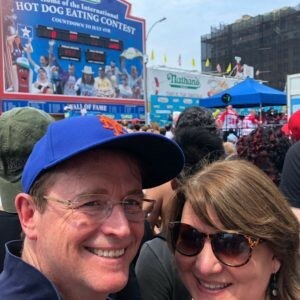 How would it improve the reputation of Christians if every church had these wonderful, ridiculous events? Who wouldn’t want to join a group of people running around a gym in their Sunday best with flapjack-laden skillets? I have attended three years of Pancake Races at Plymouth. 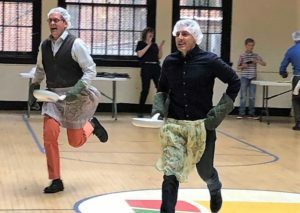 Our races, which take place on the Sunday before Lent, include hairnets, oven mitts, spatulas and aprons. The early races were not particularly competitive. Women ran in heels. But by 2017 the decision was made to slow down the children’s races by having participants run backwards. This rules change was reversed one race later. In 2018, a few elbows flew. There were casualties. Some questioned whether one winner’s pancake was flipped the requisite number of times. At this year’s extravaganza, we limited the carnage and the chicanery. We made it clear there would be no hiding pancakes in pockets to replace dropped pancakes. We let spectators know that gambling would not be allowed. We treated the races with the respect they deserve. The competition was fierce, but there were no injuries. There were accusation of PEDs, but no proof. One gridiron gladiator hid the others’ aprons, but felt bad about it afterwards. The runners ran with dignity. Six centuries ago churches in England began having pancake lunches on the day before Lent to use up the butter, milk, eggs, sugar and fat that were forbidden during Lent. On Pancake Tuesday in 1445 a woman in Olney, England – whose name was lost to history but whose influence was not – was so intent on making pancakes that she did not notice the time until she heard the church bell ring. 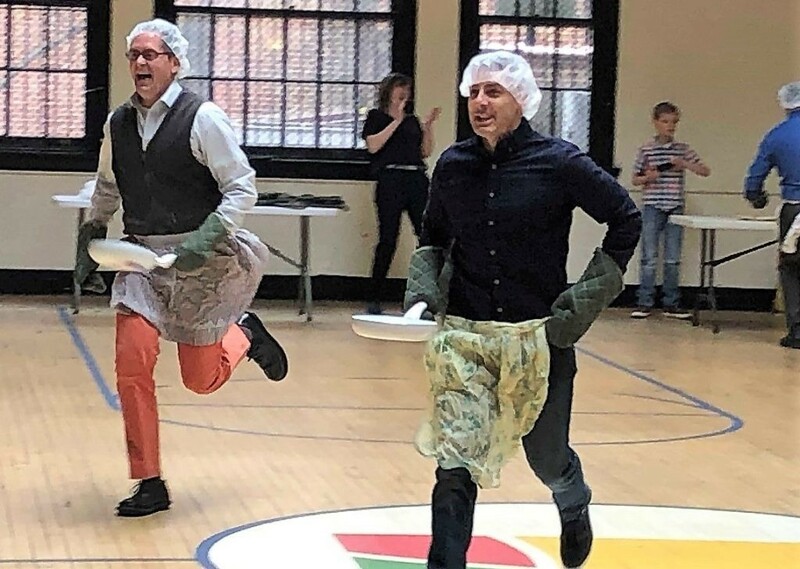 She raced out of the house and down the street to the church still wearing her apron, pancakes still in her frying pan, tossing them to prevent burning. Women were soon racing through the streets flipping pancakes. The first woman to complete the course, arrive at the church, serve her pancake to the bell ringer and be kissed by him was declared the winner. There is not much biblical precedent for pancake races. Cakes were offered in the temple (Exodus 29:2), but cakes offered to the “queen of heaven” were idolatrous (Jeremiah 7:18). Well-intentioned interpreters who look for theological meaning in the ingredients are on shaky ground. Some see eggs as a symbol for creation, flour as the staff of life, salt as wholesomeness and milk as purity. These commentators are trying way too hard. Experts in dream interpretation say pancakes are spiritual in nature. Dreams of serving pancakes indicate a longing for joy. Dreams of eating pancakes suggest the desire for a closer family. Some associate pancakes with belonging, because their grandparents made blueberry buttermilk pancakes. March 5 was the day of preparation for Lent this year. Shrove Tuesday is more fun than it sounds. “Shrove” means to hear the confession of sins, assure forgiveness and give spiritual advice. This does not sound like a party, but Fat Tuesday or Mardi Gras does suggest “Let the good times roll!” In Iceland, Pancake Day is known as Bursting Day – an apt name for a day of stuffing ourselves. The point of Pancake Day is not to get the partying out of our system before Lent begins. Feast days remind us to live in gratitude. Celebration, reveling in the pleasures of life, helps us pay attention. 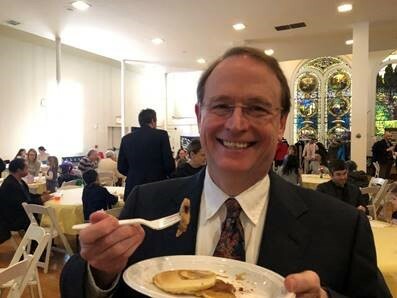 We need to thank God for the laughter of a good church, the joy of forgiveness and the taste of pancakes soaked in syrup. You and I try to be nice. We are friendly. We smile. We are kind. Some people make it hard. Some people are annoying. People who park illegally, and get away with it. People on the subway who put their phone on speaker—and it is never the conversation you want to listen in on. I heard a person in line at Five Guys announce he is a vegetarian. He is annoying. People who stand in the middle of the escalator. People who don’t know what a spoiler alert is, who insist on telling you that Bradley Cooper dies in A Star is Born. The list of annoying people includes those who do not wait for their turn to speak, because whatever they are saying is so much more important than whatever you are saying, even though they have already said what they are saying four times and it has not been smart any of the four. People who deny climate change. What part of melting glaciers don’t you get? 2016 sets a global temperature record, which is broken in 2017, and broken again in 2018. We have alarming increases in drought, flood, and wildfire. No credible scientists deny global warming, but risking the planet is profitable. Some, but not most, politicians are hard to take. Those politicians whose goal is power, who are willing to lie, who mislead people into voting for them, and who sell their votes to organizations who are not helping the ones who need help. They make it hard, but maybe we should try to stop being so annoyed. We can live with a sense of mercy that makes our lives better. We can act with kindness. It is possible, that on rare occasions, we are annoying. In those moments we need to remember that love and forgiveness come as gifts. We need to get out of the judgment business. The grace offered the disgraceful is the grace we need. We should accept annoying people, because we have been accepted. The hard, holy truth is that God’s grace is for everyone. We took Carol to Westville Dumbo, a trendy breakfast spot, for her birthday. I could have ordered seared marinated tofu, but I went with scrambled eggs and toast. 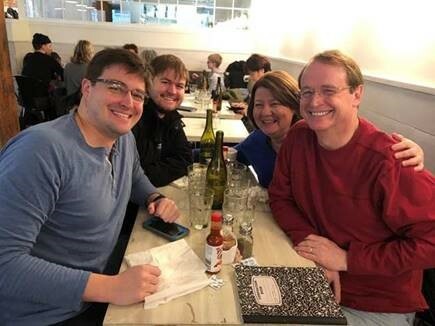 As we waited for Carol’s beets with goat cheese and sweet roasted walnuts, we took turns naming things we love about Carol – her intelligence, her infectious laughter, her patience, her editing skills, her reasonable height and her willingness to be the subject of other people’s columns. Then Amy Poehler came in. We are a “Parks and Rec” family. All of us would love to vote for Leslie Knope, the perky, mid-level bureaucrat in the Parks Department of Pawnee, a fictional town in Indiana we would have visited by now if it existed. Ron Swanson is our favorite libertarian, Ann Perkins our favorite nurse, Andy Dwyer our favorite shoe shiner and Mouse Rat our favorite band. (We are the kind of fans who know that every Mouse Rat song includes one of these two lyrics – “Spread your wings and fly” or “You deserve to be a champion.”) Our family cried at Li’l Sebastian’s Memorial Service. We imagine how sweet Sweetums must be. Leslie’s hatred of libraries makes us question our love for libraries. We have lived in Brooklyn long enough to know that when we see a celebrity, we do not acknowledge their fame. We do not touch them, talk to them, look them in the eye, ask for autographs, follow them into the bathroom or take a picture. If the celebrity happens to be in a picture the waitress takes of your family that is just a coincidence. (You can see Amy just to the left of Graham’s head.) When this happy coincidence happens, we do not share it, tweet it or Instagram it. Carol is right. If we ignore the person at our table in favor of the celebrity two tables away, then we have a problem. A culture that suggests fame is the ultimate measure of success makes us feel bad that we do not look like Ryan Gosling. Plastic surgery seems reasonable. Reality TV passes for reality. Celebrity news looks like real news. If the mostly unknown believe that being mostly known is the goal that matters most, then they are not going to feel good about themselves. When we become more interested in fame than reality, then we need to put down Us Weekly and pick up The New York Times. We need to be able to name more senators than “Real Housewives.” We need to know more about the co-worker at the next desk than about Ariana Grande. When celebrities whine about being famous it seems ridiculous that they are complaining about achieving something so many people want, but they have a point. Fame does not usually lead to happiness. Celebrities often feel trapped by their fame. And yet, most of us harbor a secret desire to be famous. We crave the tiny reassurance of attention. We wait to be discovered. We are disappointed that we are not more celebrated. Letting go of our desire to be famous could lead to better birthdays. Admiring people who do things worthy of our admiration – hard workers, loving parents, good listeners, caring teachers – could help us understand that anonymity is okay. The happiest person could be a perky, mid-level bureaucrat who enjoys life and a good breakfast. I got to technology late. I bought a new electric typewriter cheap right after they were obsolete. 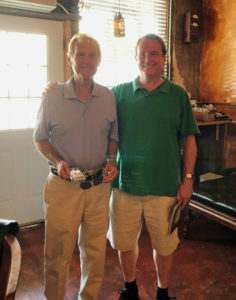 I avoided email until I was the only one who had never heard from a Nigerian prince. I don’t have a Facebook page, so someone else made one for me without me knowing it. Did you know they could do that? 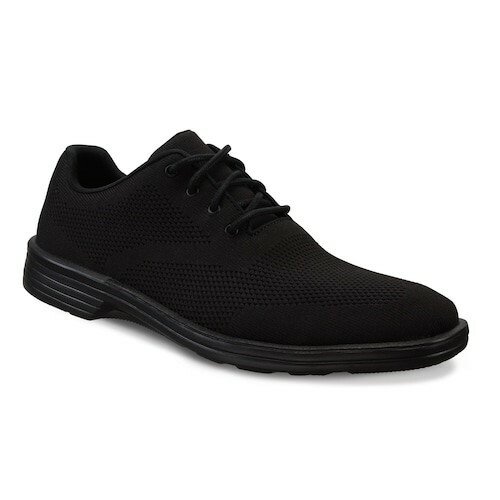 I am so happy with my Skeechers Dress Knit Relaxed Fit Memory Foam Oxford Shoes. For a while I expected someone to say, “Hey, you’re wearing tennis shoes to work,” but I no longer think it is going to happen. This has led to a new appreciation of my Google machine. You can google your way through life. The possibilities are amazing. Google “things to do on your commute,” and listen to a podcast, make your to-do list, or get your worrying out of the way. Google “how to get along with a grumpy co-worker,” and stay cool, take a timeout, and say their name. Google “things to daydream about” and imagine sitting in a bathtub full of bubbles with a good book, going on a road trip with your best friend, or lunch. Google “cures for an afternoon slump,” and rub peppermint oil on your hands, brush your teeth, or try some yoga. If you want “ways to kill time on youtube” you can find bad lip reading, honey badger, and sneezing baby panda. If you can’t sleep, google “when you can’t sleep,” and turn down the thermostat, take a hot shower, and drink some milk. The Google machine has more applications to church life than you might think. If you are having trouble “keeping your child quiet during worship,” google it, give them a phone, hand them Goldfish, or let them wear black sneakers. Google your way to “ideas for livening up a dull Bible study” like turn down the thermostat, paint something, and use pillows instead of chairs. Google “ideas for adding fun to a church meeting,” and throw stuffed animals at anyone who says anything negative, bring an egg timer, or go to a movie instead. A new son-in-law will have the feeling that he walked into the wrong class—English literature instead of the calculus for which he studied. Everyone else knows all the answers. There will be names, dates, and stories for which they only use the punch line: “We know not to let Linda fix the turkey. Ha! Ha!” The poor confused son-in-law will smile stupidly, having no idea what’s going on. Some in-laws will hope to be a little less confused at Christmas. A few will spend Thanksgiving trying to make other plans for Christmas. Several college students will second-guess their decision to shave their feeble attempts at moustaches rather than face the humiliating comments of their fathers. Homes that have gotten along on ham sandwiches and microwave pizzas will see some pretty fancy cooking on November 22. For all the trouble we go to, Thanksgiving does not really happen for everyone. Many of us will be glad that we have what we have, but gladness is not gratefulness. The people having turkey and dressing will outnumber those having a real experience of gratitude. Thinking about what we want is easier than thinking about what we’ve been given. For most of us, having more has not made us more grateful. God calls us to more than a pause to say thanks. God invites us to spend our lives gratefully responding to God’s goodness. Where do you go to retire when you have been on Sesame Street since 1969? What neighborhood is going to have such sunny days? Where is the air going to be so sweet? Where will he find such friendly neighbors? Does he understand that there are not many places where everything’s A-Okay? How can a retirement community be an improvement when you have lived on a street where birds, monsters, and people live in harmony? Spinney met his wife Debra in 1972 while in the Big Bird costume. What woman would not be impressed? He is going miss wearing bright yellow feathers and being 8 feet, 2 inches tall. Bird and guest starred on Saturday Night Live, The West Wing and The Colbert Report. He has been the BBF (best bird friend) for so many children. Why would anyone want to leave Sesame Street? Do people eventually get tired of sunny days, cloudless skies, and friendly neighbors? Could it be that we can only be kind and sweet for so long? That is why we need Oscar. What could be more therapeutic than being both Big Bird and Oscar? A tender, nurturing, childlike avian is great, but there is a part of us that is a crabby, trash-talking, green monster. Big Bird and Oscar are yin and yang, Jekyll and Hyde, Mary Kate and Ashley. Oscar’s different perspective reminds us that there are other perspectives. Big Bird shows us how to be kind, but Oscar teaches us that it is okay to be grouchy. Sometimes we do not want to talk, and that is fine. We can think—even if we should not say—“Scram!” “Get lost!” “Go away!” We can be cranky without being a bad person. 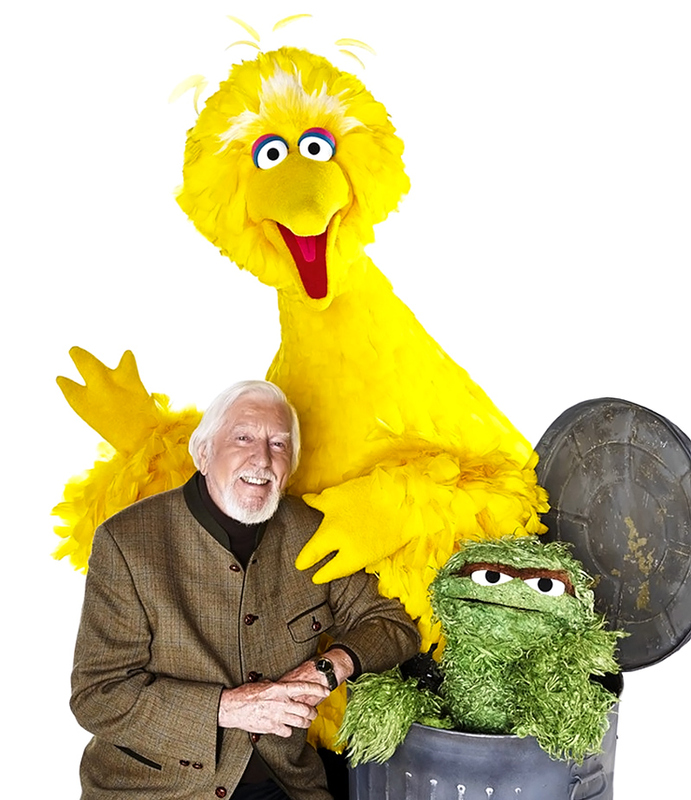 Caroll Spinney may find the world outside his old neighborhood is easier for Oscar than Big Bird. Most places are not as pristine as Sesame Street. Most air is not that sweet. Some neighbors are more irritating than Bert and Ernie. Most of us have days when we might as well live in a garbage can. We act like Big Bird, while we feel like Oscar. We are gentle, disgruntled and lovable. We need to be in touch with the grouch that stands up for what is right. We need the joy of a gargantuan canary, but we also need the feistiness of a complaining Muppet. We need to know our bad moods are not the end of the world. That could be how we get to Sesame Street.